First time about DOOGEE P1 (Smart Cube P1) could read at the end of February. Doogee P1 was unveiled during MWC 2016. 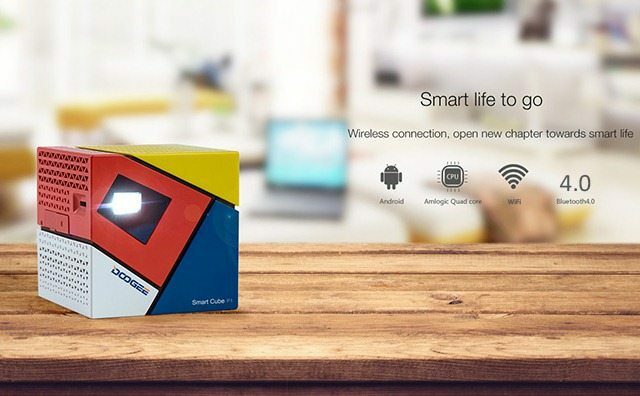 DOOGEE Smart Cube P1 is a pico projector looks like a Rubik’s cube. 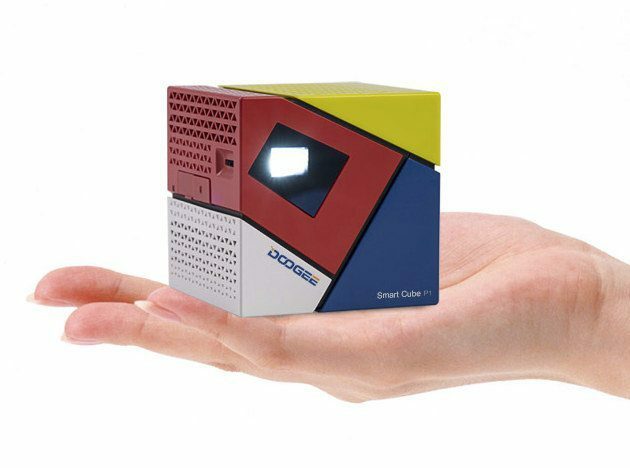 The DOOGEE P1 DLP projector is designed for connection of up to four colors – white, yellow, red and blue. he DOOGEE P1 projector is equipped with Amlogic processor (probably Amlogic S805, it is most often mounted SoC with Android 4.4 inside projectors), supported by 1 GB of RAM. Inside we can put 8 GB of their own data. On the other hand you can say that the Smart Cube P1 is a TV Box equipped with a projector. In this way, we have easy access to watching movies via Kodi, Google Store with Apps and web browser. Now Doogee P1 is available in presale on Gearbest for $169 + free shipping (Ships after Apr 04). P1 pocket DLP projector is a cube 62mm on a side. Its net weight is only 290g which can easily put into bags/pocket to go anytime. The size of projection screen can reach up to 100-inch (30-inch 1m, 60-inch 2.2m, 90-inch 3.3m distance).The Smart Cube P1 projector can display images at a maximum brightness of 70 lumens and maximum resolution of 854 x 480 pixels. Adopt advanced Texas Instruments Digital Light Processing (DLP) large screen projection technology and originally German imported OSRAM light, and allows for service lives i excess of 30,000 hours. The Doogee P1 support various wireless transmission technology including DLNA/Miracast/Air Play/Bluetooth/WiFi and mobile devices like smartphones, tablets, and laptops. P1 pocket projector comes with loudspeaker box which can connect to outer speaker devices by bluetooth to achieve the same playing function as home theatre and local music.Use the most advanced heat dissipation technology of graphite and fans. Now worry about heat dissipation. DOOGEE P1 DLP projector also has 4800mAH super large plymer battery make it posibble for users to continuously enjoy smart entertainment life for 3 hours. The Doogee P1 support USB and Micro USB charge interfaces. It can also power other devices as power bank. As we wrote at the beginning DOOGEE P1 DLP projector is available in presale on Gearbest for $169. You can also find more information on the product page. Below, a video showing DOOGEE P1 in action.